When I had my first baby, I used these tips - they work like a charm! I used an ordinary-sized coffee mug to keep the baby's cereal warm. 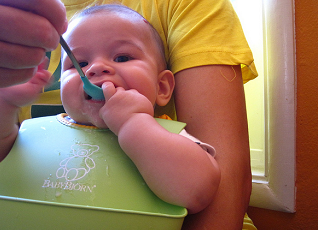 Plus, it has a handle so you can feed the baby with ease. After you are done, rinse out and fill with a cup of coffee. Why not use paper cups? Stack them, sort them, pile them up, build a castle! When the baby is finished playing, the cups are cheap to replace too. If you're low on cash and do your own laundry, an extra shower rod placed in the middle of shower stall works awesome for drying clothes. Thanks to Sarah Corinne for these Frugal Baby Tips!